Barack Obama was born in Hawaii on August 4, 1961, to Barack Obama, Sr. and Ann Dunham. His parents met while attending the University of Hawaii, where his father was enrolled as a foreign student. Barack's parents eventually divorced, and after his mother remarried, he lived in Indonesia for a time before returning to Hawaii to live with his grandparents. He later moved to New York, where he graduated from Columbia University in 1983. True to the values of empathy and service that his mother instilled in him, Barack put law school on hold after college and moved to Chicago, where he became a community organizer with a church-based group that was dedicated to improving living conditions in poor neighborhoods. It was here that he realized it would take changes in our laws and politics to truly improve the lives of the people in these impoverished neighborhoods. Barack earned his law degree from Harvard in 1991, where he became the first African-American president of the Harvard Law Review. He then returned to Chicago to practice as a civil rights lawyer and teach constitutional law. His advocacy work led him to run for the Illinois State Senate, where he served for eight years beginning in 1996. While in the Illinois State Senate, Barack served as chairman of the Public Health and Welfare Committee. In 2004, well into his U.S. Senate campaign, Barack wrote and delivered the keynote address at the 2004 Democratic National Convention in Boston, and became a rising star in U.S. politics. A few months later, he was elected to the U.S. Senate with a landslide 70% of the vote. Four months into his senate career, Time magazine named him "one of the world's most influential people," calling him "one of the most admired politicians in America." 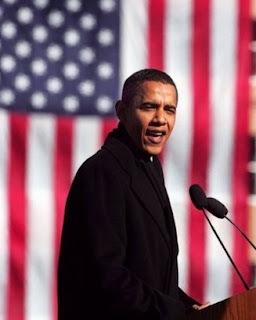 Barack formally announced his candidacy for the 2008 presidential election in Springfield, Illinois on February 10, 2007.